See, be seen, and stay charged on the go. This all-in-one lantern, light, and USB charger offers illumination and power anywhere. Clip it on to see or be seen while hiking or commuting. Or keep it in your bag as a backup power supply for camping or in an emergency. 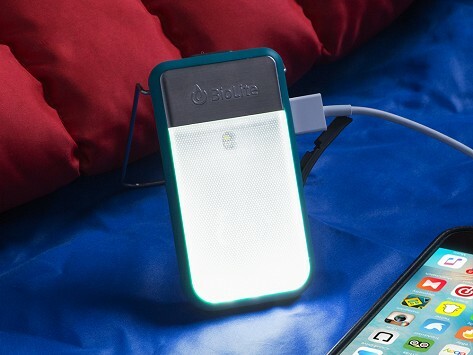 Dimensions: 3.35" x 2.1" x 0.59"
From emergencies to camping, BioLite’s power supply and lighting innovations bring charging and illumination anywhere. They design every solution to work as well in developing countries as it does here. Alec Drummond and Jonathan Cedar bonded over their passion for sustainable design, then started on a mission to develop clean, affordable energy. By creating products to take off the grid, they can serve places in the world without reliable access to electricity. A great example is their CampStove. It turns twigs, leaves, and other biomatter into usable electricity and cooking heat, courtesy of a thermoelectric generator. The energy created can charge your devices via the integrated USB port. Plus, an internal fan helps to produce a cleaner, more efficient burn that emits less smoke. 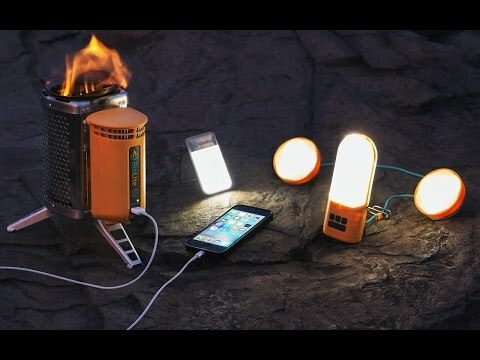 This technology—cool on your camping trip—is vital in remote countries. There, people often have cellphones but lack access to electricity and heat. They also tend to cook on open fires, which create dangerous amounts of smoke. Just for those populations, BioLite offers a larger version of the CampStove that makes cooking as well as charging simpler and safer. BioLite believes energy is a basic human need and they’re committed to sharing it with the world.